In heart-wrenching and controversial news, Japan’s fisheries minister says the country will begin whaling in Antarctic waters once again this year, with additional security to fend off those pesky activists. These whale hunts have become extremely tense as a result of conflict with the Sea Shepherd Conservation Society. The previous expedition was cut short after several confrontations at sea, and it’s been unclear until now whether the hunt would be held again this year. The answer was confirmed Tuesday by fisheries minister Michihiko Kano, who indicated the hunt would go ahead, with additional precautions to ensure the whalers’ safety. The whale hunt is expected to begin this December. Despite commercial whaling being banned since 1986, Japan still conducts hunts in the northwest Pacific and Antarctic under exceptions that allow limited kills for research purposes. Tokyo claims the research is necessary for data on whale populations, to re-evaluate the international ban on whaling. Opponents claim the program is a disguise used to keep Japan’s withering whaling industry alive in any way possible. The Sea Shepherd group is already rallying to block the hunt and has been criticized in its attempts to stop the kills. 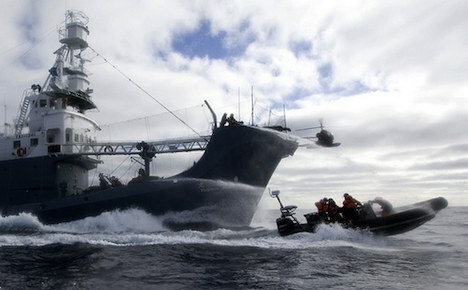 Last year one Sea Shepherd vessel sunk after colliding with a Japanese ship. The captain was arrested after boarding a whaling ship from a jet ski and brought to Japan for trial where he was convicted of assault, vandalism, and three other charges. He was given a suspended prison term. Despite worldwide anti-whaling organizations, Japan’s strong pro-whaling position apparently has plenty of public support, with an AP poll finding that 52% favor it, 35% are neutral about it and a mere 13% oppose it. Whale meat is commonly found in stores and restaurants in Japan, and was once a common item on school lunch menus. Due to the high price, it’s generally sold as a gourmet item. Do you think whaling for “research purposes” is acceptable today, or should opponents push an anti-whaling stance within Japan as well? Image CC licensed by guano: Sea Shepherd crew members getting hosed by water cannons. I would Just like to say that Whaling is not illegal and the Whales that Japan hunts are not endangered. Whaling may have been banned in 1986 because of fears that the annual cull exceeded sustainable levels. However there is overwhelming proof that whale numbers have since re bounded, and that whaling can be continued under controlled circumstances without any risk of the population decreasing. So my question is what is the problem with it? Remember neither Green peace nor the Sea Sheppard ever state that whales are endangered. This article states that whale meat is often sold in supermarkets. This is in fact not true. I have been living in Japan for 6 months now and i have not seen any whale meat at all. Judging by your very well written comment you must be a genius. I will believe everything that you say because you are so wise. I also like how you have put everything in capital letters to emphasize your point. It makes you seem even more intelligent. Seeing as how the Japanese are now being punished by god for there reckless behavior would it be fair to ask which country is next in line to face punishment? America for there murderess campaign in Iraq? China for its terrible civil rights record? How about most of Europe for all the destruction they caused in Africa? Or how about you for your incredibly insensitive comment? it is a sin to hate but not a sin to kill animals for food. There’s over 6 billion people on earth, we’re definitely not an endagered species, so is it ok for mw to asume by your comment that you also suport mass killings, like in Burma, or ethnic cleansings like in Somalia etc.etc. It’s all good correct? As long as it’s all under control, right?No organization in the world has ever declared us in danger, so where would you like to start the killings? Do you have a particular age group? Should we start with people over 60? Are we going to include children in this? Is there a certain race that you favor? Chriscameron112233, before you ask such uninformed questions, you really should do some research such as recent research done in California regarding intelligence of whales and dolphins, their comprehension of self awareness, ethics and pain. Harpooning a whale and detonating an explosive deep inside it’s body and still taking upwards of 30minutes to die an agonizing death while being dragged at the end of a steel cable is surely not acceptable even by your standards, I suggest. You don’t seem like a very nice human being.